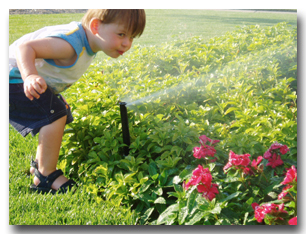 Custom Lawn Sprinkler Co is a family run business that has been servicing over 1,000 customers in the western suburbs since 1993. Our customers stay with us because they appreciate the friendly, honest and dependable service we give them. Our loyalty to our customers has always been a priority for us and that's why our customers continue to do business with us year after year. We do a lot to ensure our customers satisfaction. Here are a number of things to consider when making your irrigation, landscaping and snow removal choices . . .
We use the best quality parts, timers and other electrical equipment offered from Rainbird and Hunter to ensure dependable performance and long lasting durability. We are fully insured and warranty our work for a complete season and three years on parts. Most often irrigation work requires inside access to water supply valves and or timers. We know how busy our customers are and will work with you to find a time that someone will be home and schedule our appointments so that we don't keep customers waiting. Our work, particularly with sprinkler systems, requires a customized design that meets the needs of the customer and is appropriate to the size of the property, the terrain, the type of vegetation and other unique features that may be relevant. We won't guarantee you the lowest price, but we will promise you a quality system at a competitive price that will last a long time and won't be a source of constant headaches. Many of our competitors don't price their bids fairly. A well installed sprinkler system should last. We go the extra mile to assure a maintenance free system. 65% of new customers each year call us after a bad experience with the company that installed their sprinklers. Many have us repair or even re-design their system. The money they thought they were saving initially inevitably costs them more in the long run. Do your homework and get experienced people working for you. Financing is available, we also except cash, check, Visa and Mastercard for your convienence.